After a few hours of fishing, the husband came back home and decided to take a nap. 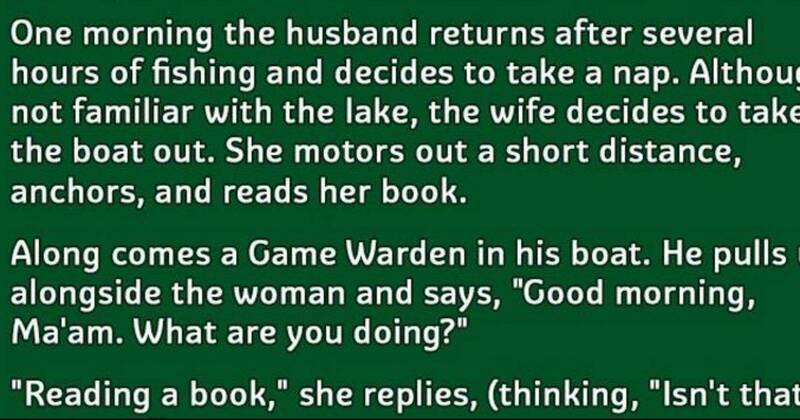 Even though his wife was not familiar with the lake, she still decided to take the boat out. After she went a short distance, she anchored the boat and started reading her book. Game Warden came near in his boat, pulled alongside and wished her a good morning, asking her what she was doing. She answered that she was reading a book, which was totally obvious. The man informed her that she was in a restricted fishing area. She apologized, explaining that she had not been fishing, but reading. The man told her that she had all the equipment, which meant that she could have started it any moment. Because of that, he had to take her in and write her up. The woman said that if he did that, she would charge him with sexual assault. The game warden said that that would be absurd because he had not even touched her. The woman, still, replied that he could start that at any moment, because he had all the equipment. This caused the game warden to leave instantly, wishing the woman a good day. 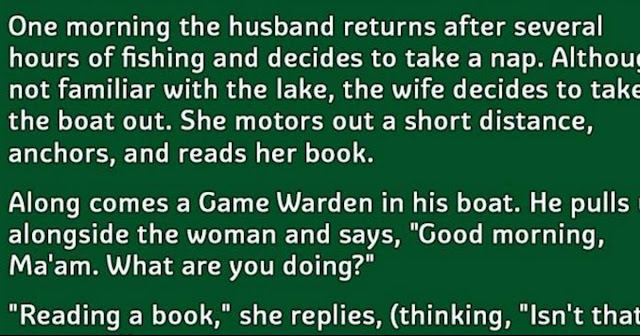 The moral of this story is that one should not mess with a woman that reads. The reason? There is a great chance that she also thinks! As we can all see, a little bit of thinking can outsmart a bully. This goes to government bullies as well. They seem to be everywhere around us, not just slinking around in taxpayer-funded offices in Washington, D.C.
We can learn from this funny story that even though the government takes every chance it gets to bully people into accepting its liberal agenda, it can still, most of the time, be outsmarted.